As the driver replaces his steering wheel and steps out of his cockpit in parc ferme after two hours of intense concentration and having been subjected to gruelingg-forces, noise and nearly always high temperatures, he waves to his team and supporters before being ushered away into the paddock building as he makes his way towards the podium. It used to be that the next we saw of them was when they appeared as they walked onto the three-step platform above the pit lane and waved again to the crowd below. Meanwhile the TV cameras zoomed in so the global audience could see the expressions of assured confidence, of delight/amazement from just being there, or of frustration of those critical seconds lost with a sticking wheel-nut during the pitstops or an overshoot (or even, dare I say it, team politics) which cost the driver the chance of standing on a higher step than the one he is on. In recent times however, we get a more 'fly on the wall' glimpse behind what goes on once the drivers have disappeared through the doorway near where the cars come to rest. The cameraman now follows them into the bowels of the building and immediately circles them as they take their turn to stand on the weighing scales, still holding on to their crash helmet and gloves. The modern access to this previously hallowed sanctum also captures for us the precise moment when these young men step off the scales and onto the corporate juggernaut. For attending each driver is a member of their team's marketing personnel. He first hands his charge a bottle of water and a towel but, as the water is downed and the face momentarily vanishes then reappears from the folds of the towel, he also passes on two other items; the obligatory sponsor's baseball cap - and the driver's wristwatch. All of the above takes place in under ninety seconds as the TV audience must get to see the podium ceremony before the credits begin to roll, but isn't it interesting that in this short timeframe the driver makes certain that he has these two items before ascending to the podium and then on to the televised press conference? Of course motorsport has always had a close association with timing, and over the years the tables have turned from when the sport needed - and paid for - timing solutions to where the providers of these solutions now need - and pay for - any marketable association with the sport. So when the driver turns to his post-race assistant in the moments after the race to exchange his helmet for his cap and his watch, he is, more often than not, slipping onto his wrist a watch which is not only his, but one which also bears his name, features a tribute to his achievements and also has the number '1' of an exclusively limited edition of identical pieces which will be available for a short while before being sold out - immortalizing that watch and creating a collector's item. The first watch/driver endorsement I can recall with clarity was the TAG Heuer 6000 series Ayrton Senna edition when he was driving for Marlboro McLaren. The mesmerising combination of the car in it's red and white colours and the yellow crash helmet is surely one of the most enduring F1 images I can think of. Still fresh twenty years and more on. I remember that watch so well because I wanted one badly, but living in the sticks, being not very well financed and before the rolling out of the internet, circumstances meant that sadly this was not to happen. C'est la vie. Of course years beforehand, Jack Heuer (who had specialised in chronograph movements with sports timing in mind) and his eponymous watch brand Heuer cemented an enduring relationship with motor racing when Steve McQueen famously wore the Heuer Monaco Chronograph while starring in the wonderful 1971 movie 'Le Mans'. So strong was the connection that today TAG Heuer still occasionally release Steve McQueen Monaco editions. As a lad, TAG (at that time a manufacturer of high-performance turbochargers and components ) always caught my eye as an associated motorsport brand when it's name adorned the flanks of the Williams racers of 1978 onwards. There was something about the design of their motif which somehow made it stand out from most of the other brands (excepting Air Saudia) which liveried the car at the time. 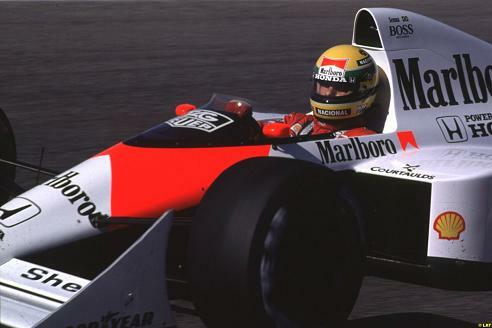 When TAG acquired Heuer watches in 1985, at a stroke one of the world's best-known brand names and instantly recognisable corporate identities today was created, and the first place many of us saw the TAG Heuer brand was on the sides of the stunning Marlboro McLaren TAG Porsche MP4/2. This relationship between McLaren and TAG Heuer was much much deeper than most sponsor agreements as both organisations became umbilically intertwined commercially. The two brands remain inseparable to this day, and when one of the McLaren drivers is handed his watch before climbing the stairs to the podium, a closer look will reveal that it is always a new TAG Heuer piece, most recently the new Carrera model. 2008 F1 World Champion and McLaren driver Lewis Hamilton is one of a number of TAG Heuer's brand ambassadors. So, if Lewis Hamilton is 'the face of' TAG Heuer and no doubt his new stable-mate, current World Champion, Jenson Button, will next be seen sporting his new TAG Heuer, having safely placed last year's Graham of London Brawn GP 001 Team Edition on it's winder until he is contractually free to wear it again, which watches are being worn by whom in the Grand Prix paddock? No better place to start I suppose, than with the World Champion. So Jenson Button, freshly signed to McLaren from World Constructor's Champions, Brawn GP. What's he wearing? 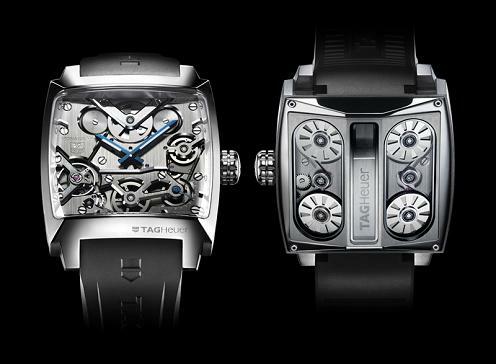 Well, as I write above, it will be something from the higher end of TAG Heuer's collections. We have yet to see what exactly. However, coming to McLaren from the most successful F1 team of all time (winning both Driver's and Constructor's championships in their first - and only - season!) he would have been quite happy to see Graham of London stepping in as watch partner and sponsor to his Brawn Grand Prix team. Team principal Ross Brawn, having miraculously salvaged his team from the claws of oblivion following the departure from the sport of previous owners Honda in the last days of 2008, saw that his team hit the ground running. Late, but running.... well. So well indeed that by the seventh race of the season, Button had taken top honours in all but one! 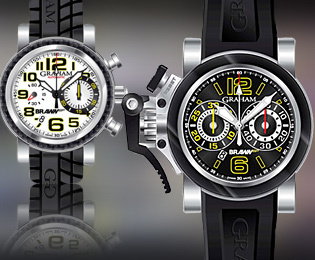 With this dramatic level of achievement, potential sponsors made their enquiries and midway through the season Graham of London appeared on the cars and on the wrist of the coming World Champion. However Brawn GP lasted but one season - although that was long enough to rewrite the record books - and Mercedes acquired the team in the '09-'10 closed season. They needed a driver as their World Champ was gone! Following months of speculation, seven-times champion Michael Schumacher was announced as coming out of retirement and joining the German marque where his professional career had begun twenty years ago! Some coup! The team still have Graham watches as their partner and it will be interesting to see who wears what around that garage as Schumacher currently remains a principal brand ambassador for rivals Omega. I dare say MS will get his way - just as he got his teammate Nico Rosberg's team number '3' because he didn't fancy even numbers..... Graham will have to grit their teeth as the man whose salary they help pay ponders whether to wear his Graham or one of his eponymous signed Omega Speedmasters. Nico Rosberg, who looks like a good team player (he'll need that quality this year! ), will take his Graham gladly, will wear it everywhere and smile broadly. Next up is Jenson Button's new home - McLaren. We know that they are joined at the hip to TAG Heuer who have some interesting pieces appearing this year, not least their Silverstone reissue and perhaps the belt-driven Monaco V4 which has been popping up in various shows and publications recently (although I first saw it as a concept at BaselWorld in 2007). Former double World Champ Fernando Alonso has arrived as Massa's teammate at Ferrari to much fanfare. He claims it was his destiny and it would be good for the competition to see this top driver in quality machinery. As far as his watches go, he did have a Fernando Alonso edition TAG Heuer a few years ago, but sadly rather put the kybosh on that arrangement when he spectacularly fell out with his then team McLaren. I notice that Spanish jewelery brand Viceroy have a current Fernando Alonso watch collection which retails for about €150 - €300. That would be Felipe 1, Fernando 0 in the Scuderia Ferrari wrist stakes then. Sebastian Vettel is my favourite for the driver's championship this year - sorry Seb, I've probably just put the clappers on you - in his Adrian Newey-designed Red Bull, one of 2009's only Brawn contenders and definitely in with a strong shout if they can carry that momentum forward into 2010. But if he's not busy winning GPs this year, then at least Vettel will be able to console himself by playing games on his watch. It's a Casio you see, so unless his face is well known by the doormen in Monaco's finest nightclubs, he might not even get in with one of those on his wrist!! Although, joking aside - to a Grand Prix team in today's turbulent financial climate, Casio's sponsorship $ is as good as any - even if the brand doesn't pack the same cachet as the Swiss establishment. The Williams F1 team have enjoyed a good relationship with Oris watches for a number of years so rookie driver Nico Hulkenberg will have his choice of Oris, whereas his experienced teammate Rubens Barrichello has a long-running - and very successful - partnership with current kings of the high-end sports watch Audemars Piguet which annually release a very limited number of new Rubens Barrichello Royal Oak Offshore pieces, usually available in diminishing numbers in carbon, titanium and rose gold. Again, like Schumacher, I imagine he will have a waiver of sorts from one manufacture or the other. Renault have shaken off their battle scars from the indignity brought upon them by 2008's Singapore 'crashgate' scandal which resulted last year in the departures in disgrace of team principal Flavio Briatore (who incidentally had his own signed F1 'Power Breaker' editions created by de Grisogono - true fact) and technical director Pat Symmonds (who didn't). The 2010 Renaults are a sight to behold and if they go as well as they look, they could be fighting for podiums this year. Unfortunately they probably won't go as well as they look. Their timing partner for 2010 is the emerging Dutch company TW Steel whose sub-£1000 oversized watches are certainly making an impact as they can be seen (or can't be missed) in a high profile marketing campaign and I'm sure on the wrists of driver Robert Kubica and well-funded Russian rookie Vitaly Petrov. 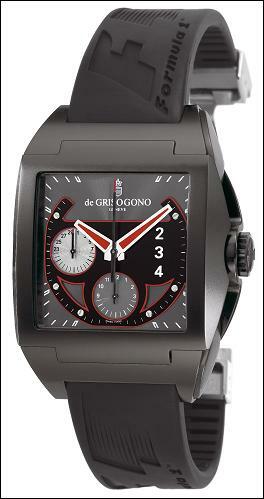 The remaining teams; Force India, Scuderia Torro Rosso, Sauber plus newcomers Virgin Racing, Lotus, Campos and USF1 have no apparent agreements with watch companies yet, although some of their drivers have enviable endorsements from trackside favourites Audemars Piguet who boast Jarno Trulli and Sebastian Buemi as brand ambassadors for the Royal Oak Offshore chronographs. TAG Heuer are a popular choice for many young or new drivers and because of their racing heritage, not to mention the marketing potential of the possibility of any of these guys being interviewed on TV in front of a global audience, the company make certain that their watches find their way to their wrists. The Senna name will hopefully make a return to F1 in the form of the great Brazilian's nephew Bruno who will be driving for the new Campos GP. I say 'hopefully' because there are doubts over the feasibility of the team and we will have to wait and see what happens with them. The same might be true of the US F1 team too. 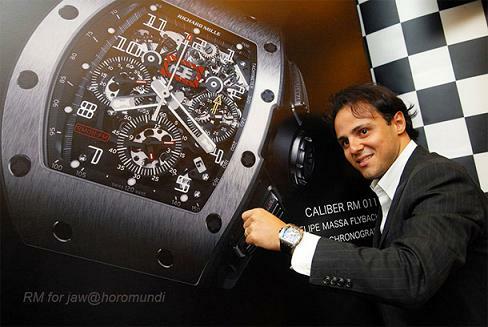 But Bruno Senna has perhaps one of the coolest brand ambassador roles of all. Bruno is a close friend of one Jean-Claude Biver, the hyper-energetic owner of the Hublot watch manufacture whose Big Bang models are raising the competitive bar to the aforementioned Royal Oak Offshore. Biver is a philanthropist and associates his brand with many charities around the world including the Instituto Ayrton Senna set up by Viviene Senna following Ayrton' death in 1994. 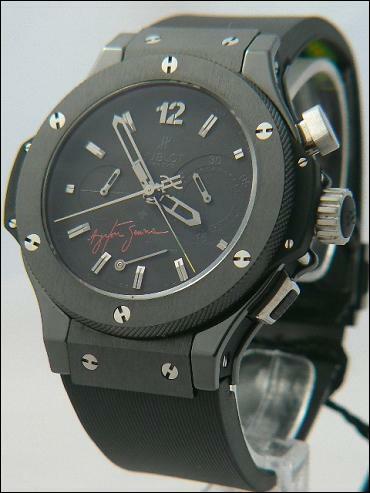 In 2007 his company unveiled their fabulous all-black 500-piece Hublot Big Bang Ayrton Senna Flyback Rattrapante Chronograph in conjunction with the Instituto Ayrton Senna and it's director Vivienne Senna. It will be the latest version of this, the Big Bang Ayrton Senna Foudroyant which Bruno will be sporting around the paddock and on the grid - that's if his team make it to the Bahrain International Circuit on March 12-14. Which neatly takes us full circle. Remember the TAG Heuer 6000 Series Senna Limited Edition that I never got to own? Well, many years later, I managed to get my hands on one of the original 500 Hublot Senna Big Bang Chronograph. It's fab, it's new in box and it's never been worn (well it's been tried on!). It's for sale..... but then that's one of my interests nowadays.